About 1867 the building of the railroad and a furnace drew a number of residents to Lowell, Ohio, including some twenty Irish Catholic families. At that time, Fr. John Begel, the chaplain to the Humility of Mary Sisters of Villa Maria, often called Charity Sisters at the time, began coming the three and a half miles across the state line and down the hill to celebrate Mass in people's homes in Lowell. Fr. 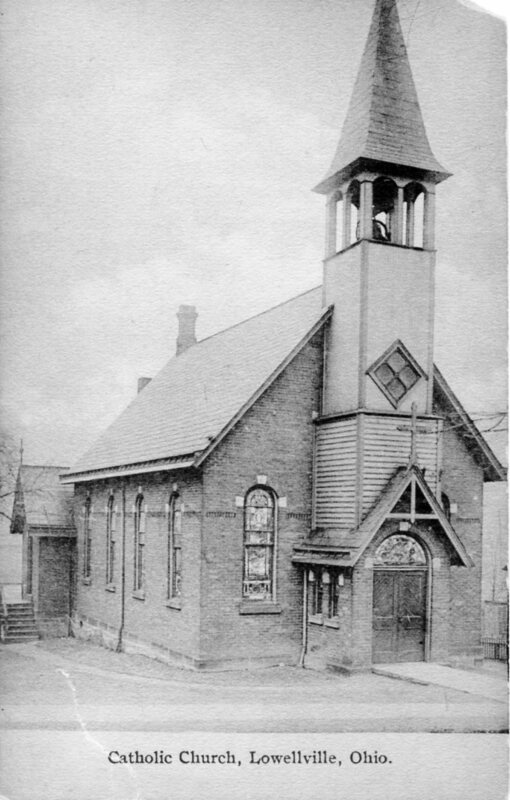 Begel wanted right away to build a small frame church for Lowell Catholics, and so a collection was taken up and land was purchased. Of the 22 parishioners who contributed to the cost of the property, Mssrs. John O'Meara and Flannery contributed the largest sum, $10.00. The following year, 1868, a foundation was laid for the church, but the economy of the village went sour and people left for work elsewhere. So the building of a Catholic church in Lowell was temporarily abandoned. Ministry to residents of Lowell was expanded, however, for the Humility of Mary Sisters built a health facility and began to nurse the sick of the community. This became crucially important when a smallpox epidemic hit Lowell in the later months of 1871. The sisters nursed almost all the sick back to health, and the villagers of Lowell were so grateful that they took up a collection for the sisters' ministries and raised $290, a considerable sum in 1872. That year of 1872, Bishop Rappe of Cleveland resigned and before Bishop Gilmour arrived, the vicar general, Fr. Hannin, transferred responsibility for the mission in Lowell to Fr. John Schaffeld, the pastor of St. Patrick Church in Hubbard. Fr. Begel was again given responsibility for the mission in 1874, but his health began to fail, and in 1879 Fr. McGovern, assigned to Brier Hill, began to minister to Lowell residents. In 1881 Fr. Nicholas Franche, the grandnephew of Fr. Begel and the chaplain at Villa Maria from 1881 to 1937, was assigned responsibility for ministering to the Lowell mission. He celebrated Mass once a month in the home of Hannah Driscoll, whose grandson, Fr. William Martin, was ordained the first priest from Holy Rosary Parish. As the economy of the village began to improve when two more railroads were built and the furnace reopened, Fr. Franche was determined to complete the building of the church that was begun in 1868. That first church, built in 1884, was a brick structure 26 x 56 feet, and it cost $3600. Fr. Franche first celebrated Mass in the Church of Our Lady of the Holy Rosary on Christmas Day, 1884. In 1895 a choir loft was built and an organ purchased for $125, and in 1896 a furnace was added. But another event for the parish in the 1890's was the addition of the first Italian names to the parish rolls, Peter Pirone and Nicola Lombardi. With the founding of the Mount Carmel Society, a fraternal organization that made Italian immigrants welcome in the newly incorporated village of Lowellville, both the village and the parish were enriched with new residents and members. Fr. Franche continued to minister to our church till 1903, when it was assigned to Fr. Patrick Byrne, the pastor of St. Nicholas Parish, Struthers. He was succeeded in 1913 by Fr. Nicholas Monaghan, who also had responsibility for Our Lady of the Holy Rosary as a mission of St. Nicholas. He was a man of interesting wit. He would tell his servers from Struthers that they had to watch out for the Lowellville boys, and he would tell his Lowellville servers that they had to watch out for the Struthers boys. 1923 brought the first resident pastor, Fr. Daniel Kirby. On May 30, 1931 Fr. William Martin, the first son of our parish, was ordained a priest for the Diocese of Cleveland. Two sisters to the Humility of Mary congregation also came from our parish, Sr. M. Florence Meehan and Sr. M. Thomas Martin, during the years between the two world wars. In 1935 an energetic and much loved assistant pastor, Fr. James Moran was assigned to join Fr. Kirby. A former boxer, Fr. Moran would pull young men out of the bars and pool hall to attend devotions in the church. Since the parish had grown from 25 families in the time of Fr. Franche to 250 families in 1937, Frs. Kirby and Moran undertook a building program on a shoestring budget that added a basement and one wing to the church. A second wing was then added by Fr. John Cunningham, who succeeded Fr. Kirby in 1938. He was pastor when the Diocese of Youngstown was carved out of the Diocese of Cleveland in 1943 and he continued to minister through the period of the Second World War. In 1948 Fr. John Higgins was named pastor. He was succeeded in 1951 by Fr. Paul McNally and his brother, Fr. Thomas McNally, who became administrator of the parish in 1955. During their ministry the present parish rectory, a beautiful Georgian-style building, was built, and the size of the parish blossomed to more than 500 families. At the same time, the number of children to be educated in the faith was expanding, but there was no facility within which to teach them. One of the Humility of Mary Sisters, Sr. Joseph Marie Good, in the midst of her twenty-year commitment to the children of the parish, was teaching them in the pews of the church. Fr. William Witt was assigned to the parish in 1962. He began in earnest to address the new needs of the parish. He purchased the Woodlow Bowling Alley, a block east of the church, to be used as an educational center. The building was first used October 20, 1963, to honor Sr. Joseph Marie, the sister who had been teaching the children for 20 years. After the building was remodeled it also served as a temporary church from October 1964 to Easter 1968. In 1966, Fr. Witt announced plans for a new church to be built in observance of the 100th Anniversary of the parish the next year. Fr. Witt traveled extensively to develop the design of the church and to commission original art. Then in July the parishioners volunteered time and effort to gather some 55,000 tons of limestone from the local Carbon Limestone Company. To support the effort, women of the parish made pizza and coffee and local bars furnished free beer. Christmas Day 1966 was chosen for the ground-breaking ceremonies and the excavation started on January 10, 1967. Then on the Vigil of Easter, April 13, 1968, Fr. Witt lit the paschal candle from the new fire at the old church building and led the congregation in procession across the street into their beautiful new church. The church was dedicated by Bishop James w. Malone on All Saints Day, November 1, 1969. The estimated $163, 000 expense for the church grew to over $203,000 and it fell on Fr. Witt's successor, Fr. Carl Forgach, to retire the debt. He was named pastor in 1973. He not only paid off the debt for the church, but he also added the $73,000 bell tower, which had originally been planned but not built. It was dedicated on the vigil of the Immaculate Conception, December 7, 1980. Fr. A. Edward Gretchko was named pastor in 1986, and he was succeeded by Fr. William Loveless in 1990. During their pastorates, the second priest to come from Our Lady of the Holy Rosary Parish, Fr. Pat B. Ferraro, studied for the Diocese of Youngstown. He was ordained a priest of the diocese June 13, 1992, and was assigned as an associate pastor to St. Christine Parish in Youngstown.